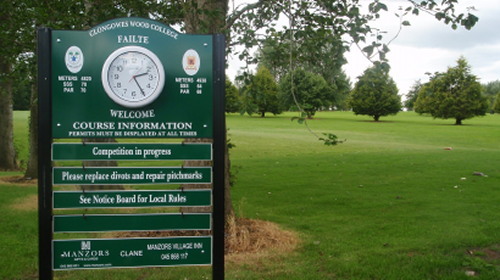 It is a great honour for me to be Captain of Clane Golf Club for 2019. I am pleased to announce James Malone as my Vice-Captain for 2019. I look forward to working with the committee and to help make 2019 another successful year for our club. I and the committee are there to serve your needs, so please get out and play in as many competitions during the year as you can. I would like to see greater support for the “Thursday Rob” and the mixed competitions. What better way to pass a few hours on a summers evening. I would appeal to the younger members to get involved in the running of the club. I hope we all have a very enjoyable years golf in 2019 and most of all let us have fun. I would like to wish Sandra Morrissey, Lady Captain and all the members of the Ladies Club a successful and enjoyable 2019.
all members and visitors to our website. This website is updated weekly with all the latest news, results and fixtures available by clicking on the appropriate tabs. We hope you enjoy your browse around our site and look forward to seeing you on the course.